Ever since I was in kindergarten, I wished I was Greek. My mom, my sister, and my sister's boyfriend all worked at the same Greek restaurant and they made the BEST Greek food. The owners had a daughter my age and we were best friends. I spent a lot of time over her house and loved being surrounded by her Greek culture. Her Yaya (grandma) lived directly behind her and she was the sweetest woman! She made the most delicious avgolemeno soup I have ever had. I wanted a Yaya of my own so badly that one of my mom's good friends let me call her Yaya -- and I still do, a good 25 years later! As luck would have it, almost twelve years ago I had an opportunity to live in Greece. It was a life changing experience in many ways. I learned a lot about who I was and where I was in my life, and what I wanted to do next. It was not always pretty but I wouldn't trade that year for the world. Yield: I make this in 9x13 pan and get about 20-30 slices. It's all in how you cut it. Place the sugar, honey, 1 1/2 cups water, the vanilla and the lemon juice in a pan and boil for 5-6 minutes. 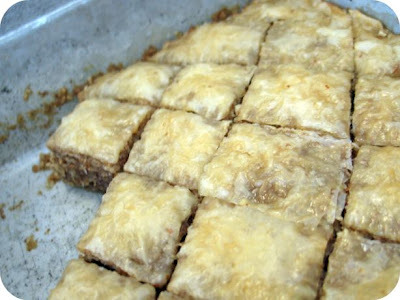 Skim off any foam that forms and pour the hot syrup over the lukewarm baklava. (Note: it will look like you're completely submerging the baklava, but its a sponge and will drink it all up! I promise!). Serve cold. Does the 800 grams of almonds just equal 1 cup or is 800 grams more then 1 cup? I've always wanted to try a good bakalava. Hopefully when I make it it trys out as good as yours looks. Grace - your comment really blew me away. I took about 10 pictures of the baklava and this was one of two that came out. I think that might be one of the best comments ever! Nicole - when I make this I weigh the almonds as I go but if you don't have a scale 800 grams of almonds are about 1 lb 12 oz of whole nuts. 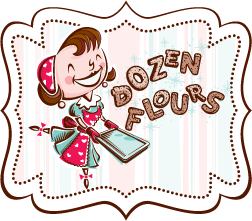 I used unsalted, raw almonds but you can also do half almond and half walnut. I hope that helps! 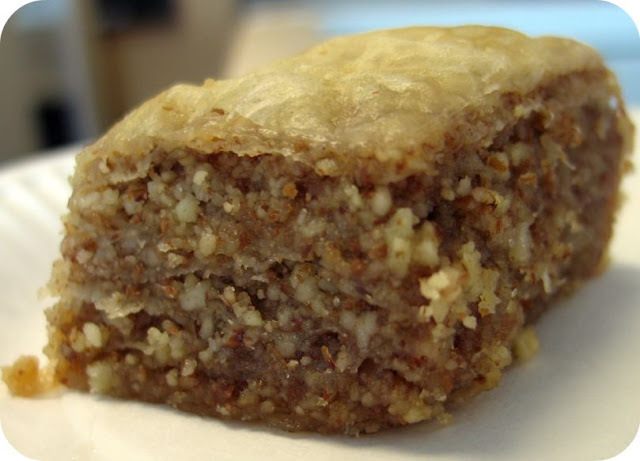 I never would have ever thought to attempt my own baklava, but you made it sound easy. I'll have to try this someday. This looks sooo good i too am a big lover of Baklava. I will definitely be making this recipe, thanks for posting it. BTW i just love your blog.